Plotting the Barnsley Fern in 1812? The play "Arcadia" features a precocious young woman discovering fractal geometry (and the second law of thermodynamics in an amazing two-fer.) A contemporary mathematician explains that actually drawing a strange attractor by hand would require years and years of effort. 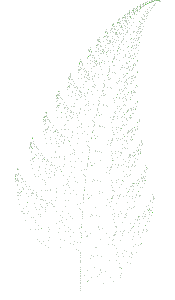 Here's a sample fractal we can use for comparison, the Barnsley Fern: https://en.wikipedia.org/wiki/Barnsley_fern It's described by four linear transformations, which require four multiplications and up to six additions per application. Logarithms are not a 19th-century invention. They're a 17th-century invention. So anybody who can add by hand can multiply quickly as well, through the use of a published book of logarithms. Because the ability to plot accurately by hand is limited too, we don't need very many digits of accuracy. 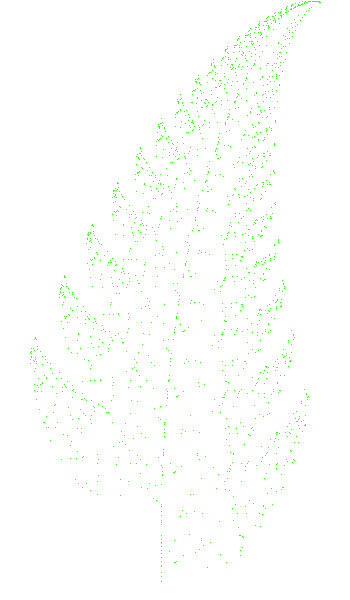 Here's the Barnsley Fern with just 2000 data points, clearly recognizable as a plant shape. So how quickly could our 19th-century heroine compute these 2000 points? Slide rules had already been invented (though their modern form had to wait until 1859.) Sadly, I cannot come up with a good reference for the actual speed of human calculation on, say, 8-digit numbers such as Kepler performed. If we allow Thomasina a leisurely 1 minute per lookup, then she can perform about 7.5 iterations per hour of work. 2000 iterations are then 267 hours, or a mere seven modern work-weeks. Challenging to accomplish, but not impossible either for a dedicated worker.